Even if you've seen The Hunger Games films dozens of times, the books will reveal character complexities that were left out of the film adaptations. This article is brought to you in partnership with Scholastic Books. There was a time during which books formed very loose bases for their related films and the constant cliché of “the book is better” resounded and abounded. After all, one could scarcely directly translate a book into a film, especially one as fantastic and expansive as The Hunger Games (2008) and its sequels Catching Fire (2009) and Mockingjay (2010). Over the years, Hollywood has come to trust the source material much more than before. Multipart adaptations of single books, longer running time, and great advancements in Computer Generated Imagery (not to mention producer realization that the books they are adapting became popular because of, not in spite of, their content) have all combined to allow books like The Hunger Games Trilogy to survive virtually intact in their onscreen bows. However, books and films are two very different media, and as close as we have gotten (and as great as the four Hunger Games movies are), pictures still cannot capture the personal engagement that novels offer their readers. After all, DVDs do not provide a “Writer’s Cut” of films. In short, the book is still better. The most noteworthy difference between the film and book series is the films’ removal of main character Katniss Everdeen’s first-person narrative. Directors Gary Ross and Francis Lawrence wisely elected to eschew a voiceover for Katniss (played onscreen by Jennifer Lawrence), instead allowing the visuals to tell her personal story. This further allowed scenes that Katniss was not present for to be shown onscreen and without her there to recount the events. For example, the gravitas of the fate of Seneca Crane (Wes Bentley) is seen as part of the final wrapping up of the first film (rather than being revealed later when Katniss learns the news). This makes for good cinema, but viewers miss out on the depth of Katniss’ personal and philosophical thought. Her elaborations on her feelings and her turmoil with the impossible (and unenviable) choices that she has to make bring the reader into Katniss’ very thought process and immerse them in her mixed emotions. The cold impact of the death of Rue (Amandla Stenberg) is seen through the acting of Lawrence, but not felt personally by the viewer. In the films, Katniss seems to have a purely antagonistic relationship with the character of Joanna Mason (Jenna Malone). In the book, the relationship is much more complex and rocky, yet a friendship, nonetheless. The simple act of President Snow (Donald Sutherland) shaking his head (to suggest that her love-acting wasn’t good enough) is brought to cold terror on the page as she wonders if she has condemned Peeta with her failure. The conflict of emotions that she faces when evaluating potential futures with Peeta Mellark (Josh Hutcherson) and Gale Hawthorne (Liam Hemsworth) can only be fully appreciated when read from the page. Onscreen, the kiss Katniss gives to Gale during the events of Mockingjay could be construed as teasing or toying, especially when Gale’s reaction is seen. In the book, the depth of Katniss’ feelings is fully explored. Onscreen the betrayal of the brainwashed Peeta as he attacks Katniss is seen in Lawrence’s eyes. In the book her confusion and devastation are palpable. The films The Hunger Games through Mockingjay Part 2 tell the story of Katniss. The books The Hunger Games, Catching Fire and Mockingjay quite simply are Katniss Everdeen. It would be a hard sell to suggest that Haymitch Abernathy was ill-treated in his translation from page to screen. With popular and award winning actor Woody Harrelson brought in to portray the character, we see his damaged dual nature and both his struggle with and embrace of his alcoholism. He is a character who has forcefully had to control his emotions, yet his character is filled with passion and heroism. The untimely death of actor Philip Seymour Hoffman even forced his character Plutarch Heavensbee to be replaced by Haymitch in a vital scene with Katniss toward the end of Mockingjay Part 2. Surprisingly, even Haymitch’s backstory is much better served in the book. Onscreen we see Haymitch both caring for and attempting to remain detached from Katniss and Peeta all the while self-medicating with alcohol. In the book, the coldness of Haymitch is felt by Katniss as she is both embraced and rejected by this dejected older survivor. Haymitch’s drunkenness actually becomes a memorable part of the reaping in the first book when an inebriated Haymitch not only shows up loaded to the reaping, but actually falls off the stage in a stupor. This scene is not duplicated in the film. While it could be argued that such a scene would be difficult to execute with sensitivity as well as tragic comedy, another moment from the books is more conspicuously absent. In the story, Haymitch survives his turn in the Hunger Games (during the second “quarter quell”) with cunning ingenuity, using the game makers’ force field against his final opponent. In the book Catching Fire Katniss is actually shown archival video of this unique action as the dying young Haymitch manages to survive by tricking the penultimate contestant into killing herself. This admittedly bloody scene might have cost the film version its PG-13 rating, but its omission hits hard for readers of the book. The romance between Peeta and Katniss is the most complex and complicated of any other relationship in the saga. To be fair, the films manage to make this both logical and engrossing as their seemingly staged love becomes more real and powerful. As previously mentioned, Jennifer Lawrence gives a beautifully pained performance as she explores these emotions while Josh Hutcherson evolves from reserved admirer to impassioned lover. But in the book there is so much more. The romance between the two is much more demonstrative on the page and much more canny, especially as Katniss’ first person account shows her realization of Peeta’s feeling and her eventual reciprocation. During this evolution we see Katniss and Peeta finishing their first Hunger Games together and holding the Capital hostage by threatening to die together on camera. This translates well to the screen. In the book we also see Katniss pounding against a glass door and screaming Peeta’s name as they are separated in the final airlift. Katniss may not know her own feelings yet, but the audience understands that whatever the level of love she may have for Peeta, it is very clearly love. The film skips this moment. Similarly missing is the scene in which Katniss tells Peeta the story about her younger sister’s goat, Lady. This may seem like a simple, throwaway story, but for the first time, the diamond-hard Katniss is truly showing her heart to Peeta. This makes a big difference in the evolution of their love story. The same is true for the physical side of their relationship. While never explicit, the book does contain much more of the physical romance between Katniss and Peeta, including an entire night of kissing on the beach that is omitted from the films. It may be that the filmmakers elected to keep things vague so as to continue the question of the love triangle between Gale, Katniss and Peeta; however, this may well have been a mistake as the onscreen Gale actually manages to receive more of Katniss’ kisses than the onscreen Peeta. The Hunger Games Complete 4-Film Collection was released on Blu-ray in March 2016. These four films constitute some of the most textually accurate novel adaptations to date. For all the advancements in film technology, not to mention respect for the source material, there is still no replacement for the novel itself. Those content to watch the film series (which is, admittedly, very well done) are missing much of the story and tone. 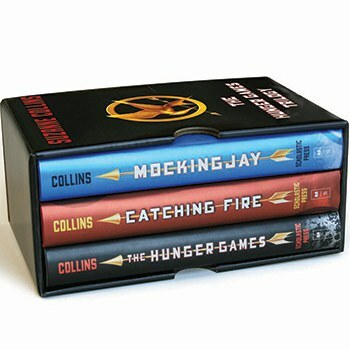 While the film saga does capture the action of The Hunger Games, the novels are most assuredly the heart of the story. They are nothing less than “The Writer’s Cut” of the films themselves. The book is still better!